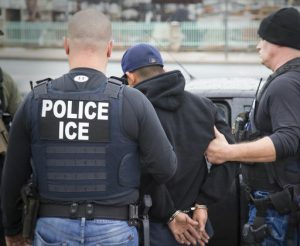 Between Jan. 22 and April 29, the immigration enforcement agency arrested 41,318 individuals on civil immigration charges, 75 percent of whom were convicted criminals, after Trump signed immigration-related executive orders in January. That number represents a 37.6 percent increase from the same period in 2016. "These statistics reflect President Trump's commitment to enforce our immigration laws fairly and across the board," ICE Acting Director Thomas Homan said in a statement. "ICE agents and officers have been given clear direction to focus on threats to public safety and national security, which has resulted in a substantial increase in the arrest of convicted criminal aliens." ICE arrested 30,473 convicted criminal aliens this year, a 20 percent jump from the 25,786 arrested last year. Noncriminal arrests increased from 4,200 in 2016 to 10,800 in 2017. The agency said that Secretary of Homeland Security John Kelly's decision to "no longer exempt any class of individuals from removal proceedings if they are found to be in the country illegally" has helped lead to higher arrest numbers. Authorities also arrested 50 percent more "aliens at-large in the community" from the same period last year. Homan pledged to give arrestees due process, citing the fact that America is a "nation of laws." "All of those arrested will receive the due process afforded to them under the law," Homan said. "ICE will take action to remove individuals subject to a final order by a federal immigration judge. We are a nation of laws, and ignoring orders issued by federal judges undermines our constitutional government." News of the higher arrest rate came after multiple reports indicated the Department of Homeland Security has stepped up its immigration enforcement since Trump took office. Last week, ICE reported that it arrested more than 1,000 individuals, including 445 foreign nationals, in a six-week operation targeting gangs. Data published by the Washington Post in April seemed to foreshadow ICE's latest report, revealing that authorities arrested about 5,000 more immigrants in the beginning of 2017 than in early 2016. The number of noncriminal, undocumented immigrants arrested also doubled. Homan reiterated the agency's mission to enforce the law, arguing Wednesday that doing so would keep communities safe. "When we encounter others who are in the country unlawfully, we will execute our sworn duty and enforce the law. As the data demonstrates, ICE continues to execute our mission professionally and in accordance with the law, and our communities will be much safer for it," he said.